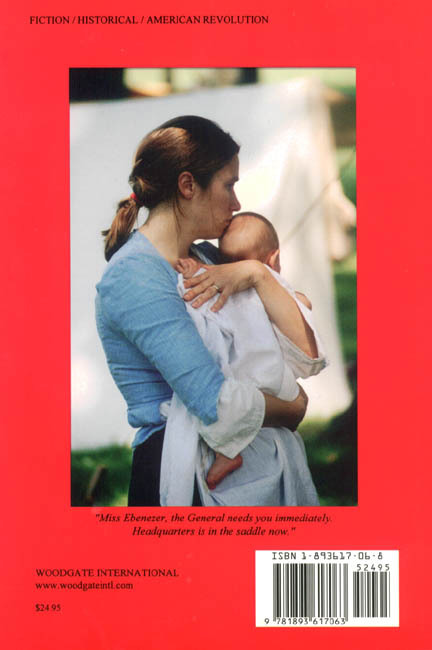 Bootmaker to the Nation chronicles the lives of two early American characters, Benjamin and Genevieve, whose lives will fill you with homegrown pride and a renewed sense of what it truly means to be American. It is fundamentally a moving story of courage, struggle and hope–set during a time when our fledgling country searched for its unique identity and independence. The life of Benjamin York, a British-born apprentice cobbler and committed freedom fighter, parallels the evolution of a newly formed union that would become the United States. Slade’s novel makes our history accessible and real. Had we read this book as children instead of so many chapters in history textbooks, we would now possess a much deeper understanding of the defining moments that lead our founding fathers to risk everything for our future. Bootmaker to the Nation is a love story on many levels, but it also allows you to live American history through the eyes of Benjamin and Genevieve as you revel in their trials, hardships and triumphs. You will feel a growing prescence of something great about to happen as you fly through these pages. Slade weaves a poingnant and mesmerizing narrative of two young Americans seamlessly with the history of our revolution. From the arduous trip across the Atlantic aboard a British frigate to the last days of the American Revolution, you will accompany Benjamin York, and his friends and family, on an epic journey. You will experience firsthand the tense battle on the green at Lexington, the relentless attack at Bunker Hill, the harsh winter at Valley Forge and the decisive battle at Yorktown. History will finally make sense. Now more than ever, when a renewed patriotism no longer rests only with government leaders, the American spirit and heart is uplifted by this tale. This is an exhilarating novel that will simply enthrall you with its adventure, sensitivity and humanity. If you love America, this book will make you love it more! Bootmaker to the Nation is a superbly written historical novel featuring an elderly couple writing about their experinces in the founding of our nation. 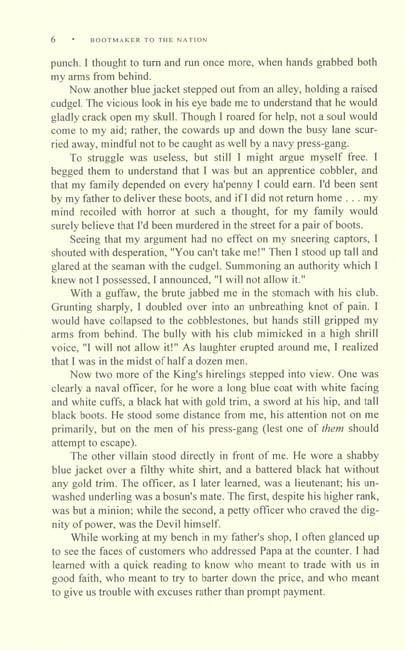 Ben is a British apprentice cobbler caught by a British Navy press gang. He is taken to a ship and forced into duty as a sailor. Arriving in the colonies, he escapes, only to be captured by British Army soldiers. Again, forced to drill and march against his will, he is captured by American revolutionaries on the way back from Concord and Lexington. One of his captors is a young lady, Genevieve, and her brothers and father. Ben becomes a revolutionary. He teaches Genevieve to read and write. She becomes a courier and later a scribe to General George Washington. The entire war and the accompanying political revolution are viewed through these two characters’ eyes in their old age. Although the length of the book is daunting, the author pulls the reader through it so well, it is hard to put down. His use of detail in the settings and the emotions of the characters are masterfully wrought. The reader is drawn into the miseries of soldeir life with no pay, no food, and inadequate protection from the elements, which are endured for an ideal, despite the lack of support from their fellow Americans. This is a history lesson made totally realistic by the author’s blending of a myriad number of facts with how they affected the characters’ lives. We rated this book a very high five hearts. I thoroughly enjoyed Bootmaker to the Nation. Lengthy books are not my usual, so I was a bit startled when I saw the number of pages. However, having committed to review, I began to read. I could not put it down and was captivated as the story unfolded and each life became real. It was an adventure back in time to an era that undoubtedly birthed ournation, and I was there. I have admired George Washington. Over and over again, his strength, honor, courage, and integrity were demonstrated. No wonder the soldiers followed him! I find it interesting that the percentage of the colonists (patriots) willing to fight ws so small compared to the population at the time. I guess I had not given much thought to the fact that not everyone was involved in the fighting the war, much less some keeping needed supplies hidden or even worse selling them to the enemy for profit. Dr. Slade did such a marvelous job in totally describing this time period that the vivid picture painted of the Revolutionary War will not be erased in my mind. I would, in fact, read it again! I have recommended Bootmaker to the Nation to some of the home school parents and will continue to do so. I think Bootmaker to the Nation would make a great movie!! 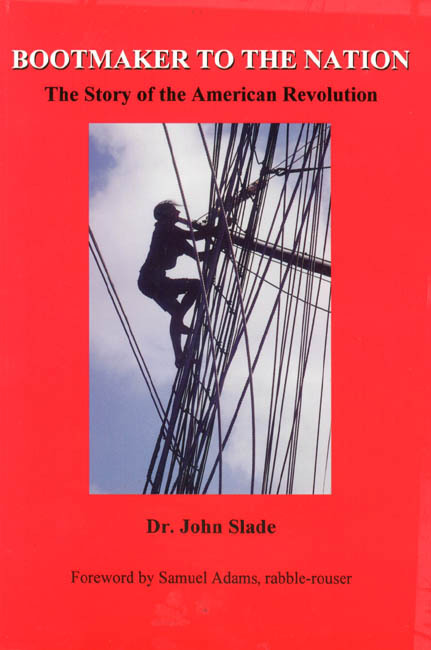 A few days ago, I received a 721 page book called, “Bootmaker to the Nation” by Dr. John Slade, to review. My first thought when looking at the enormous tome, was, “Fat chance I’ll get around to reading this.” I dropped it on my coffee table and forgot about it. Later that evening, I picked it up and started ruffling through, wondering who I could give it to to review for me! However, having nothing pressing to do at the moment, I began reading the first chapter. I was immediately hooked! 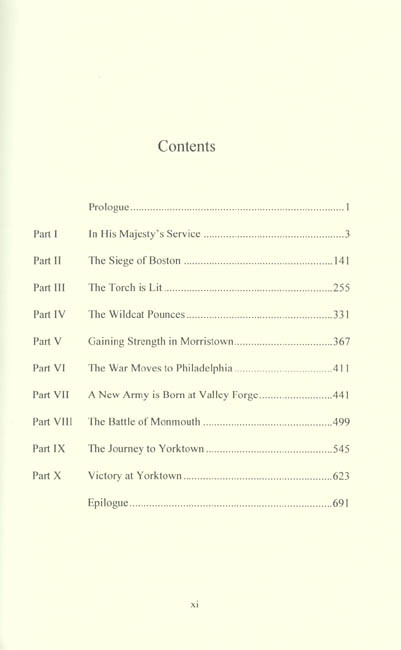 The book is historical fiction set at the time of the American Revolution, 1763 to 1783. The story is told from the point of view of a London boy named Benjamin and an American girl named Genevieve. Dr. Slade begins the story in London where Benjamin, an 18-year old cobbler’s son, is kidnapped and taken aboard the Lively, a British frigate, to be pressed into His Majesty’s navy. During the trip over he is forced to become a topman where he must climb to the top of the ship’s mast to furl and set the sail. This whole section kept me biting my nails! After he lands, he is then forced to learn to become a soldier for the Redcoats. His only goal, however, is to escape and get back to London. The story then takes us from Benjamin’s story to Genevieve’s story. I don’t want to say much more about the plot because that’s what kept me hooked! And while I was hooked, I learned about each of the battles of the Revolution, the weapons that were used, the people involved, and why we fought the war. This was much better than a history textbook! Dr. Slade’s goal in writing the book is to teach us to “love American history, understand our nation’s first war, meet our Founding Fathers as people, not as wooden heroes, and look to the future with an educated eye.” He definitely fulfills this goal. I highly recommend this for 9th graders and up. It’s available at local bookstores.